The Living Legends of Superman! "Time across the vast universe is not absolute, but is tied to a point in space. And Krypton no longer occupies a point in space - its time no longer exists. "But this is the day that its last son, Kal-El, sets aside each year as a personal memorial to spend in solitary contemplation - flying at unutterable speed through the vast galaxy among whose worlds Krypton once numbered itself - knowing that it falls to him to keep in mind the land and seas, the culture and language - the love and values that once made Krypton live. "For it is only through the memory of those who love it that a legend lives!" Start to finish, this book has been an ambitious project. I suppose you could date its beginnings from sometime in 1976, when Cary Bates and I collaborated on the script of Superman #300. That was a speculative story on future history, as this is, but this expands the scope of that speculation. "I want to get all sorts of artists in on this," Julie Schwartz growled. Julie does not talk; he growls. He growled that he wanted artists who had never done a Superman story before, who could reinterpret Superman according to their own peculiar styles. "Joe Orlando," he said, and I said now he'd be great, and he's just down the hall. "Jack Kirby," he said, and I said really? You really think we can get him to do something? "Frank Miller, Will Eisner, Berni Wrightson, Terry Austin, Marshall Rogers, Wendy Pini, Howard Chaykin, Al Williamson, Mike Kaluta, Klaus Janson, Moebius, John Byrne, Jack Davis, Leonard Starr, Brian Bolland, Walt Simonson, Mike Grell, Steve Ditko, Jerry Robinson, Bill Sienkiewicz - plus a literary salute from Ray Bradbury," he said, and I started thinking the old bugger's brain was getting buggy. "Steranko," Julie said, and I laughed. Now I knew he was joking. Never underestimate the moral power of a megalomaniacal editor with forty years of experience behind him at badgering, buttering, and blowing off steam. Never underestimate the emotional power of the greatest fantasy legend the American culture has yet produced. Julie, with some help from the talent coordinator, Sal Amendola, got them. From the far corners of the Earth, artists of dizzying stature flocked to add to their portfolios a contribution to the ongoing myth of Superman and - perhaps equally impressive in the professional world in which they live - for a chance to work with Julie Schwartz. Those who couldn't illustrate one of the story sequences found the time to do a pin-up page. Those who couldn't do a long story had their obliging writer supply an installment of suitable length. My old buddy Howard Chaykin offered a breathtaking cover painting. It is a rare opportunity for a writer to work with so many of such towering talent. I hope you find my words worthy of their storytelling. 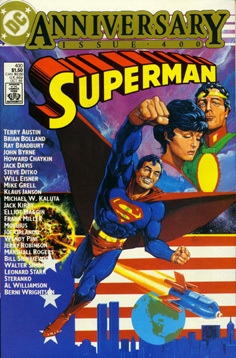 Superman #400 is available in the back-issue bins of finer comic book shops everywhere.